logo over RAPHAEL TUCK & SONS LTD --ART PUBLISHERS TO HIS MAJESTY THE KING AND TO HER MAJESTY QUEEN MARY -- LONDON ; NEW YORK -- COPYRIGHT MADE IN ENGLAND. inside left:-THE ARRIVAL AT LOFOTEN THE DEPARTURE FROM LOFOTEN. 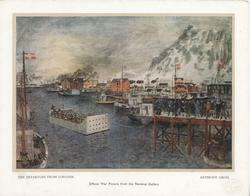 A PHASED IN THE SUCCESSFUL RAID ON THE NORWEGIAN ISLAND OF LOFOTEN PAINTED BY ONE OF THE WAR OFFICE ARTISTS FROM DESCRIPTION BY THOSE WHO TOOK PART IN IT.